Hanging baskets are an attractive way to decorate porches and verandahs with beautiful colors and different plants. Usually the kind of flowers you plant is based upon the position they are in. If they are in full or part sun, or shade, this determines the plants that can be grown. Use your imagination and likes to decide what flowers to plant. You can go with all one color, mixed colors, and holiday themes. If you want, you can use all the same flowers or mix sizes and colors in your flower baskets, window boxes, and planter stands. If you are in a warm climate you can start your hanging baskets and planters early and enjoy them for many months. 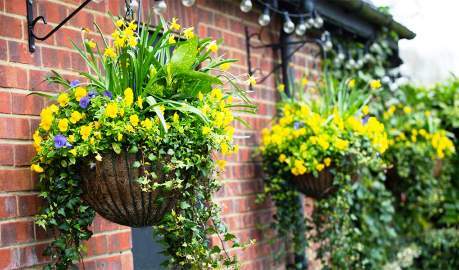 To make your house and garden attractive, try hanging baskets in other places besides the front porch. Use a shepherd's hook with a hanging basket beside your front steps or mailbox. Build an arbor and decorate it with hanging flowers. Frame your sidewalk, patio and entrances with colorful hanging baskets. When you are ready to plant, decide what kind of planter you want. The sizes vary from 6 to 12 inches. Choose a size that is appropriate for the area where it will hang. When you have the container, then you are ready to put the moss in the pot. Sphagnum moss is used because it holds moisture and helps plants grow better. After the moss is moistened and fitted into the container, then you can add the potting soil and polymers. Potting soil by itself does not hold nutrients, so polymers need to be added periodically. Hanging pots are easy to take care of and come with an external saucer or an internal disk that holds water, which can be pulled into the plant. Just continue watering and fertilizing through the summer and you will be able to enjoy your beautiful plants the entire season. Hanging baskets do not take up a lot of room and are pleasing to look at, being at eye level. With the Bloom Master hanging baskets, you do not need to use the moss. You buy the pots with growing holes and use potting mix with nutrients to help the plants grow faster and larger. These hanging baskets and box planters produce healthy beautiful plants in no time. When you have the pot prepared, place your flowers in and water them. Plant the largest flowers first and follow with the smaller ones and the fillers. Some popular flowers that are recommended for hanging baskets are petunias, impatiens, pansies, ferns, ivy, mums, coleus, fuchsias and many others. Start planning your flower gardens now and enjoy a creative, beautiful growing season. Professional Florist in London serving London and the surrounding area successfully for years.